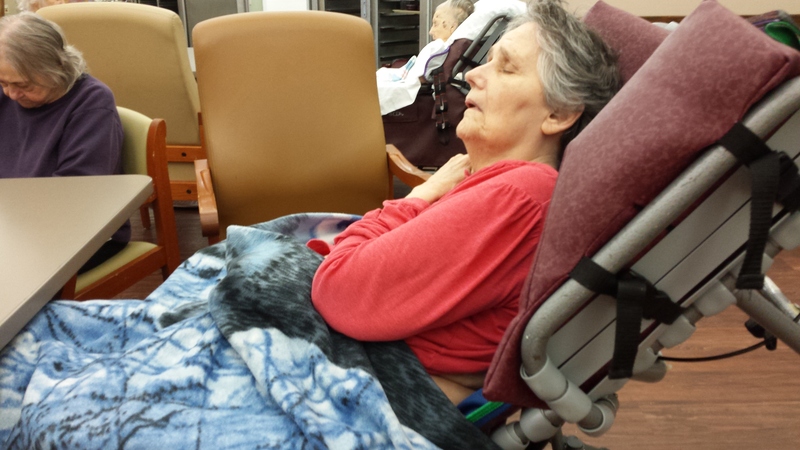 Mom’s disease has progressed quite quickly. I’m both alarmed by it and also oddly comforted – because maybe after such a long period of stability, she won’t linger in what seems to be a less pleasant state. And that will mean she is at peace. After feeding her today, I talked briefly with the receptionist at the Alz center. I said I’m concerned that at this point, she could be suffering. The receptionist, whose husband died of Alzheimer’s, doesn’t think so. Mom had a birthday since I last wrote, and is now 78 years old. Patrick, his mother and I left for vacation on her actual birthday, June 6. I visited the night before to feed Mom dinner and wish her a happy birthday – as if that mattered. It still feels like something I should do even as I know it’s a meaningless gesture. (Or is it?) The day after we returned, I went to feed her Sunday lunch. I was surprised by how I found her. 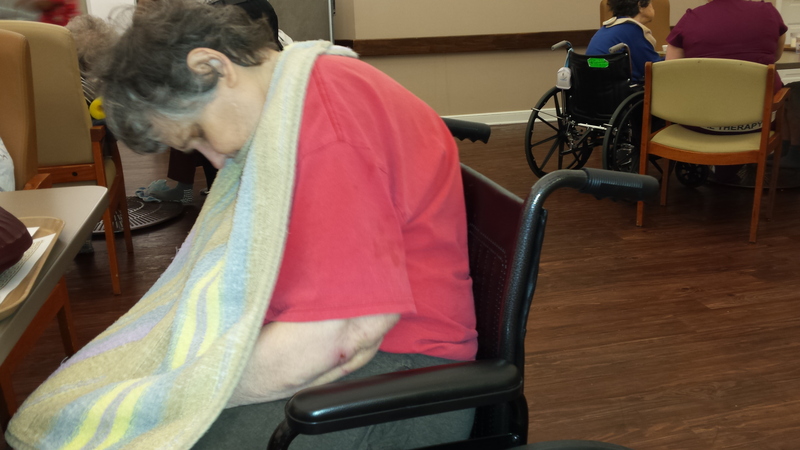 She was in a wheelchair – a first – and slumped over, asleep, just before dinner. I have rarely seen her sleep like that. I sensed from casual conversation that Mom was in a wheelchair as a matter of convenience, because she had begun to have trouble even just standing, let alone walking. I got a call a few days later, and was told that aides had found a blister on Mom’s foot, which could have been part of her problem. So treatment was planned for the blister, and I said that sounded great. I didn’t make it to the Alz center on Father’s Day. Today, two weeks since the last visit, I arrived just in time to feed her lunch. And this is how she looked. Mom was having a fitful sleep. Her legs were wrapped up in padding, she had a blanket over her lap and she was in a specialized wheelchair that tilts. Thankfully, being numbed by this discovery kept me from unleashing fury on any staff members. I had not been told she was permanently in a wheelchair and I certainly knew nothing about padding wrapped around her calves as a treatment for her legs. For as long as she has had Alzheimer’s, Mom has had very swollen calves, ankles and feet. Maybe they’re worse now. But if they are, no one told me. 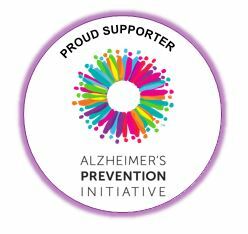 I tend to give the Alz center the benefit of the doubt. But this was stunning to me, to see Mom like this without a phone call to warn me. It was also stunning to see her take on the frail look of a very advanced Alzheimer’s patient, which, of course, she is. I woke her up to eat and she did open her eyes and dutifully accept her food and drinks. Mom would occasionally vocalize, but her voice was very raspy and weak. I talked to her about my brother’s upcoming visit and complimented her shirt, which I believe my sister bought for Mom when she moved from assisted living to the nursing home in 2009. At one point, I asked her if she liked her mashed potatoes. “Yeah,” she said. I laughed, happily surprised to hear an appropriate answer. And she gave a very slight smile. Two weeks ago, she had smiled broadly during lunch – almost a smile of pride after answering one of my questions. I enjoy those brief looks of recognition, but they also haunt me – is there more to Mom than meets the eye? Could it be her physical decline shields an ability to express an emotion? I know, intellectually, after her many years of a “slate wiped clean,” as I have described her cognitive abilities, that this is highly unlikely. But seeing her change so rapidly fills me with questions about what might be going on in what is left of her mind.